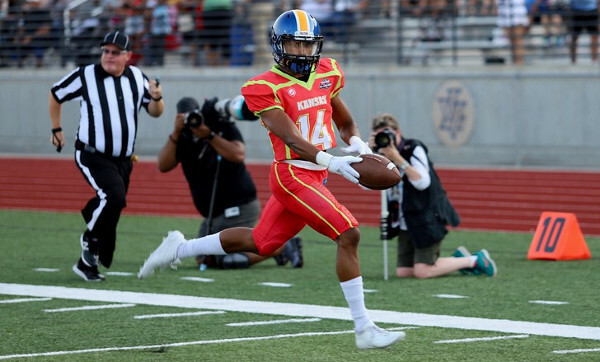 The Kansas all-stars scored in each quarter to beat Missouri 30-0 in the 27th annual BeYOUnion.com All-Star Game presented by the Greater Kansas City Football Coaches Association. The win by the Kansas stars ended seven consecutive wins by Missouri and narrowed the Show-Me State’s lead to 14-12 all-time. Kansas got on the board with defense and special teams in the first quarter as Gage Foster (Lawrence Free State) tackled a Missouri runner in the end zone for a safety and a 2-0 lead. Former Olathe South Falcon Jamison Phelps returned the ensuing kickoff 77 yards for a touchdown and Jackson Likens’ (Blue Valley) PAT pushed the lead to 9-0. Early in the second quarter, Kansas quarterback Brody Flaming (Mill Valley) hit Hayden Goodpaster (Shawnee Mission Northwest) on a 14-yard slant pattern for a touchdown. The Kansas lead remained 16-0 until late in the third quarter when Bryce Mohl (De Soto) scored on a short touchdown run to make it 23-0. In the fourth quarter, Flaming hit tight-end Joe Clune (St. Thomas Aquinas) on a 41-yard touchdown pass to push the Kansas lead to 30-0. Flaming completed 3 of 4 passes for 66 yards and two touchdowns and was named the MVP for the Kansas team, while KC Center’s Javion Shelby was named MVP for the Missouri all-stars.